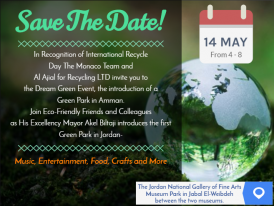 SAN MATEO, Calif. - May 9, 2016 - PRLog -- Jordan kicks off its Dream Green Campaign with festivities surrounding the inauguration of the National Gallery of Fine Arts Park in Amman. The Dream Green Park event is part of the inspiring movement in Jordan to Reduce, Reuse and Recycle. The park will be outfitted with recycle bins, solar panel lighting, recycled water and plants that need minimal water with hand cut vs. power motors for maintenance. The inauguration of the city's first 'Green' Park will take place Saturday May 14th in Jabal El-Lweibdeh from 4pm to 8pm. His Excellency, the Mayor of Amman, Akel Biltaji will dedicate the park at 4:30PM. Throughout the day visitors will enjoy tasty foods and beverages as well as live music, comedy, shopping and raffles. Exhibits and sales of local crafts and recycled handmade products will also be offered. The ultimate goal of the campaign is to raise awareness among the Jordanian population and educate the community about caring for the environment and the importance of recycling. "The Jordan National Gallery of Fine Arts Park/ El-Weibdeh can be used as a 'model' park for others to follow", said organizer and president of Monaco Business Development, Mona Naffa. "The guidelines designed and used for Jordanian public spaces and the sustainable use of solar panels, water conservation plants, recycle bins and management, embraces the environmental theme of "Reduce, Reuse, Recycle". The end results can create jobs, clean streets and continue to build happier neighborhoods who protect the environment and follow proven western practices. Partners joining in on the efforts are: City of Amman, Al Ajial for Recycling LTD, Jordan National Gallery of Fine Arts, Ministry of Environment and Monaco Business Development.